What a fabulous bag, and of course the embellishments are just superb! Phyllis, congrats on accomplishing your first leather sewing experience. 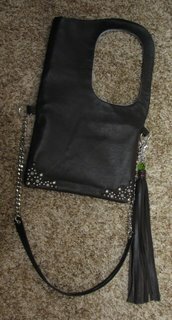 Your bag is fabulous and your embellishing skills made it one of a kind and unique. My goodness, what a beautiful bag, Phyllis! Congrats, your embellishments are astounding. Your LaRue is very yummy, Chocolate Lambskin. Excellent job thanks for posting. Very inspiring. Love all the details. The strap/handle and tassel and embellishment really set this apart. Gorgeous! Fabulous bag. Can you tell me exactly where in the construction sequence you applied the curved facings? Thanks. Your bag is gorgeous and very inspirational. Thanks to your links, I am going to tackle my fear of sewing with leather. Each bag I see completed just gets better and better. I absolutely love the details, like the studs and crystals and tassel. Just splendid. Wow what a beautiful job you did on your bag. I love the details and the studs. Thank you for the sites on ebay I’ve put them down as favorite sellers. I really like your additions/alterations to this pattern–especially the circular facing and the horizontal seam. Very nice detailing with the studs and crystals and the way you did the belt and tassel. Very Nice! Beautiful – I love the silver lining with the chocolate leather combo! $150? I think not. Thanks to the magic of sewing we all have our own *personalized* versions! Phylllis, this is so gorgeous! And you are so generous to provide links to your sources – thank you! Oh wow! I love your bag! And all the embellishments made it absolutely stunning! What a beautiful bag. The chocolate and silver is the most beautiful color combination. You certainly can’t tell it’s your first leather project. Very successful! I like your alternative facing on the armhole & making a horizontal seam in th elining to allow cleaner finishing of the edges. I was wondering if something like that would work. Your embellishments are so creative and make the bag! Phyllis, email me with your address if you want some doo-dahs (nailheads). Your handbag (in my humble opinion) looks like the best I have ever seen. 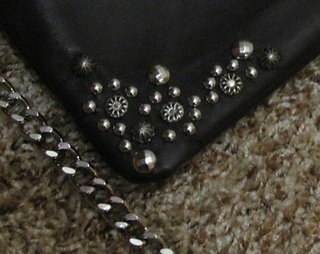 I would like to make this bag as well, but I would like to replicate the exact LaRue handbag, with distressed light brown leather, and the metallic tassel. I would also like to increase the dimensions of the handbag by 2 inches on each side (I am 5’10” and would like a larger bag for my body length) I’m a pretty good sewer, but have no idea of how to increase the dimensions accurately and how to make the curved shape closer to yours. Did you use a special cutting tool? Or did you eyeball it? Any advise and suggestions you can share would be most welcome and greatly appreciated. Thank you for sharing your fanastic looking purse! Your version is so much better than the original! Do you still have a copy of the pattern? I just found out about it and it’s long gone. Girl this bag is fabulous and I agree, it looks much better then the original. Do you sell them? Can anybody send me the pattern???? I heard it was a free down load but I can’t get it. Any help with the arm hole would be greatly appreciated. the horizontal center seam doo-hicky sounds very good too. If you would mind explaining that too. If you wouldn’t mind explaining ……. I have made two bags now. and it doesn’t look large enough even at 125% – I am just curious at what setting you printed out? OR if you sell your adjusted pattern? This is my weekend project and I need assistance with the pattern. Please help. Would you consider making some to sell?? ?